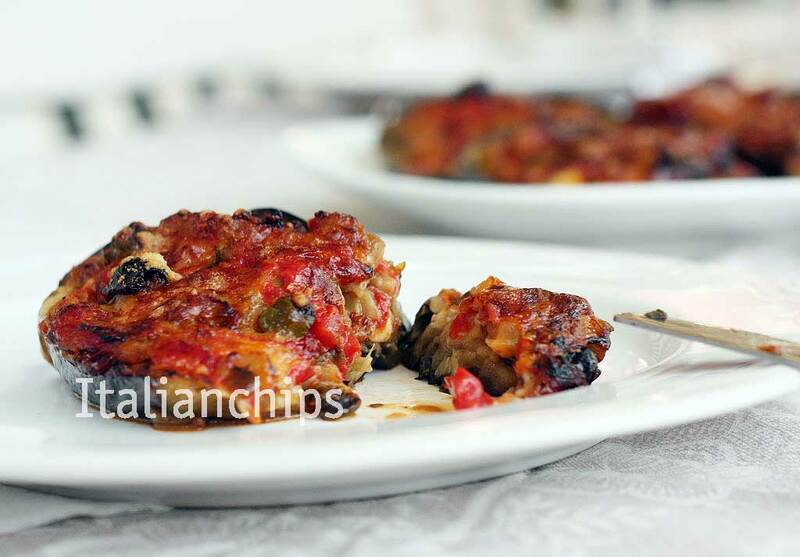 I tried this stuffed eggplant recipe the day I saw it on an Italian online food magazine. And prepared it twice in a week :-). Yes, during Summertime we are surrounded by eggplants (and tomatoes and zucchini) here in Italy. They are a healthy vegetable, with few vitamins but a lot of fiber. And God, they match so well with such a number of different ingredients. This recipe attracted me because I was curious about boiling the eggplants before stuffing them. Their final look doesn’t look like a boiled vegetable – and I assure you neither the (great) taste. I used fresh tomatoes (as I was surrounded by them too!) but you can easy use peeled canned ones too. I really enjoyed the great aroma the tomatoes spread in my kitchen while cooking with olives, capers and basil. By the way, it was the first time I paid attention to taggiasche olives. These olives were brought by San Colombano monks and were spread along Italy during the centuries, even if the biggest plantations are always in Imperia (Liguria). It is one of the best olives for producing oil and one of the best to be eaten as it is; even if they are very small they are (indeed) very tasty. Here’s the post where I saw this recipe. I changed a few things, just like using capers in salamoia instead of salted ones and other quality of tomatoes I already had at home. Cut the eggplants in 2 (in the longest way) and boil them in salted water for about 15 to 20 minutes, until they become soft when punched with a fork. Wash and cut the tomatoes in pieces. Add extra virgin olive oil to a non-adherent pan (I used just a thread of oil) and add the tomatoes, the garlic clove (do not cut it so you can eliminate it before stuffing the eggplants), the olives, capers, salt, pepper an basil leaves. Let it all cook for about 20 minutes and reserve. Drain the eggplants from the boiling water and helping yourself with a spoon, empty them leaving about 1cm/0.4in attached to the peel. Place the eggplant pulp in a colander to loose exceeding liquids. 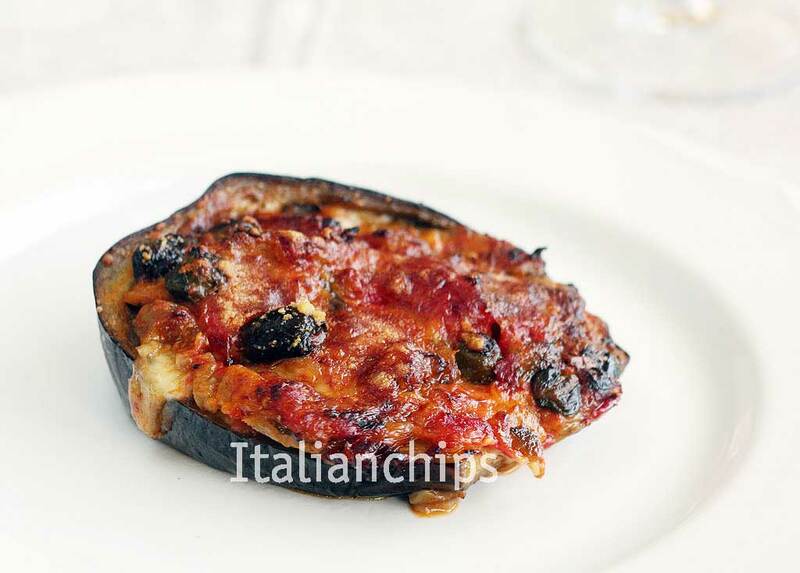 In another non-adherent pan add a thread of olive oil, dried oregano and the eggplant pulp you have cut in small pieces. Let it cook for some minutes until it looses liquids and acquire flavor. 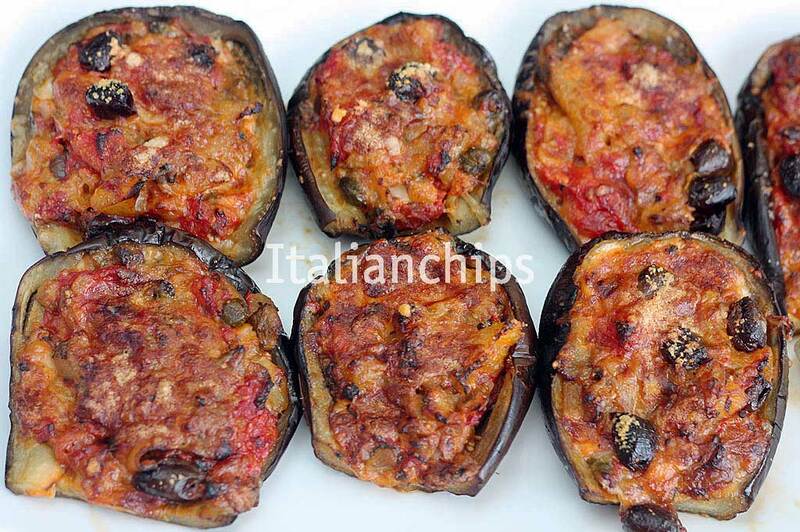 Add the tomatoes to the eggplant pulp and cook it all together for 5 minutes in medium gas. Turn off the gas and add the mozzarella cut in small cubes. Put the eggplants on an oven pan covered with parchment paper. Stuff them with the pulp mixture and spread the grated Parmesan on top. Bake for about 30 minutes or until colored on the surface. Let it cool 10 minutes before serving.